Regardless of how well you’ve coached your team and how talented they are, it’s all for naught if they are forced to play on a lousy Baseball infield. A rocky and uneven infield turns fielding a routine ground ball into a breath taking adventure, and there’s no worse a feeling than seeing your center fielder slowly disappear over the horizon because of the sloped outfield. It’s at time like this when the importance of a well designed and manicured baseball field really hits home. Whether you’re attempting to help your baseball association refurbish their baseball diamonds or building brand new ones, there are a few basic elements which should be planned for and addressed in order to achieve a good baseball field. 1. An Adequate and Proper water drainage system is extremely important. An infield which drains poorly can be a nightmare for an association with limited extra field time available to accommodate bad weather cancellations. 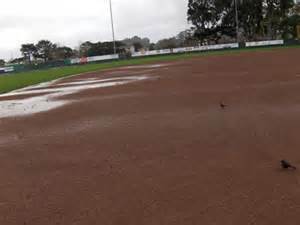 Instead of a thunderstorm causing a 1 day cancellation of games, a muddy field which refuses to dry out could wreck an entire week’s schedule. You’ll be thankful, and your predecessors will be thankful, if extra attention is afforded field drainage. 2. A properly designed and installed irrigation system allows for a well manicured, professional looking field, during the Dog Days of summer, when lack of rain turns everything brown. Unfortunately, in my experiences, irrigation systems were a viable option for only the wealthiest baseball associations, or as a donated product, however, this doesn’t mean you can’t maintain the field. Well placed water spigots around the perimeter of the baseball field, will allow irrigation through water hoses or lawn sprinklers. 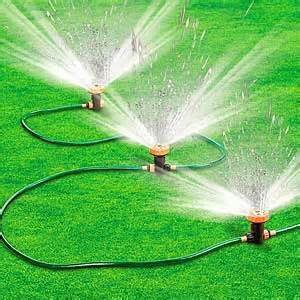 As they say “Necessity is the Mother of Invention.” For $500 you can purchase enough hoses and sprinklers to maintain a full size baseball field, instead of $20,000 for a professional system. 3. A sound maintenance system, which includes material and equipment for application, to address turf conditions of clay, sand or rock. Normal usage and inexperienced operators dragging the infields, will create dips in the infield which must be corrected immediately, or else risk eventually creating an uneven or rippled infield. As baseball & softball are the Only sports which play on fields which consists of both turf and soil for the playing surface, the challenges of field maintenance are unique when compared to other sports. About 2/3 of the game is played on the skinned surface, (dirt) and soil make-up varies from city to city, this makes a Standard “How To Do” system for maintaining infields impossible. You’ve have to use common sense on addressing your particular soil conditions. Although many aspects of building and maintaining a baseball field are Location Specific, one thing which remains constant, is the Basic Layout. Whether refurbishing or building new, this Step by Step Guideline will walk you through the procedure of creating a baseball field. 7. Power equipment makes the job easier, faster and more professional looking. Rent required power equipment if at all possible. Your back will thank you. This Step by Step Procedure is based on beginning brand new with a rough field site. When refurbishing a field, follow the steps, eliminating or modifying steps when necessary to fit your situation. 1. Start with a flat open area, preferably grassed, if not a plan for when and how to plant grass as construction proceeds should be put in place. Mark the infield perimeter with white paint in order to visualize the outfield area which will require grass to be seeded. 2. The entire field’s layout is determined by the placement of Home Plate, as every other measurement is taken off from this benchmark. When analyzing the placement location, be sure to allow for installation of a backstop, 60’ minimum distance behind the plate. 3. Once home plate is located, from the Apex (back corner) use a string and spray paint to outline a 13 foot radius and remove the grass within this radius. If you don’t plan on maintaining a grass infield skip this step and just remove all the grass on the infield. 4. Locating Second Base is next. Measure from the back tip of home plate to a distance of 127’ 3 3/8” straight out. Drive a stake into the ground to mark this spot which will be the Center of second base. I’ll repeat … the Center (Middle) of the base. Not the back or front corner as some will measure. 5. With the tape measurer already in place, from measuring to second base, mark the location of the pitching rubber at, 60’ 6.” Always use this measurement, as lesser distances for younger age groups will be modified from this spot and home plate. 6. Next find First & Third Base locations. In order to accurately locate the correct spot and maintain being square, use 2 tape measurers. Hook one on the Stake which marks Second base and measure 90’ to first base. 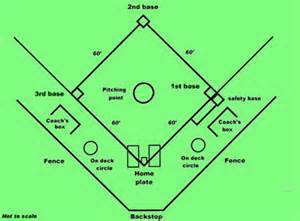 From the back corner of Home Plate measure 90’ to first base. Where these two tapes cross is the exact location of the Back Corner of the base. Repeat this procedure to locate Third Base. 7. A baseball diamond is a 90 foot square. The First & Second Base fit Within this square, but Second Base location in the square is at the Center of the base. This is the most common mistake people make when laying out a diamond. 8. If you plan on leaving the infield grass, you’ll have to create a Slide Pit Area around the base. Using string and spray paint, mark a 13 foot radius Within the 90 foot square and remove the turf. 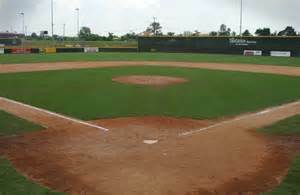 Most ball parks have infields entirely of dirt, but if the area is grassed you have an option. 9. 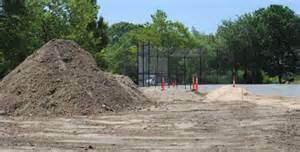 The next step is a mammoth undertaking, which is the building of a pitchers’ mound. The pitching mound has a diameter of 18’ with 10’ in front of the pitching rubber and 8’ behind the rubber. The top of the mound is a plateau, flat surface area, that is 5’ wide and is where the pitching rubber is located. 10. Mark the 18’ circle with spray paint and begin building the mound 1” at a time. 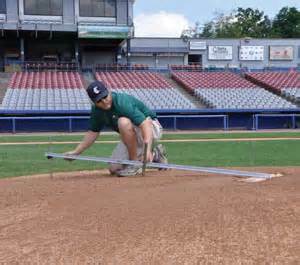 Measuring from 12” in front of the pitching rubber, at each 1” mark of elevation, begin your slope. I found it easier to work from ground level up, rather than the plateau down. If available, use a transit to insure proper height and slope, but if unavailable you can use stakes, a taunt string line, measuring tape and line level. 11. Although the proper elevation and slope of the pitching mound is important, the proper mixture of good material used to build the mound is probably more important, as a firm landing spot, which is easily repaired, is critical for safety of the players. The following mixture will also be used for the Batters’ Box and Catchers’ Box. A mixture of 40% Sand, 20% Silt and 40% Clay is essential to building areas of high traffic which can quickly degrade. This mixture resists this degradation and maintains a firm compactable surface area. When mixing these products, pretend you are mixing concrete, as the different products must be thoroughly mixed in order to properly work. The infield will be comprised of material with less clay content than the pitching mound or batters’ box, as the infield should retain moisture and firmness, but too much clay will produce a baked harden infield. Too much sand in the mixture will create unstable footing for the players and will easily and quickly develop low spots if not professionally dragged, and often creates a lip where the infield meets the outfield grass. An ideal mixture for infield soil is 60% Sand, 20% Silt and 20% Clay. The silt and clay will give the field firmness while the sand keeps the infield from compacting too hard. Building and maintaining a Baseball Field is no small task, but if you take your time, plan well and use the best available products possible, the end product will be a field easy to maintain and an infield players will be proud to play on.